The Ontario Liberal government is providing funding for 192 new long-term care beds in Flamborough. Ancaster-Dundas-Flamborough-Westdale MPP Ted McMeekin made the announcement April 20 at the Flamborough Seniors Centre, alongside Ward 15 councillor and Flamborough-Glanbrook Liberal candidate Judi Partridge and representatives from Primacare Living Solutions, who will build and operate the facility. 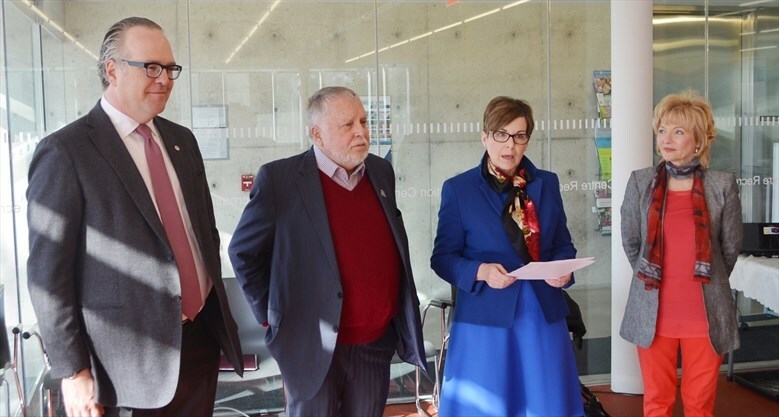 McMeekin said the beds are part of the 5,000 long-term care beds that have been allocated to communities across the province by 2022. “One of the challenges we have in this community is affordable housing for seniors.” — Judi PartridgePrimacare president Matthew Melchior said the approximately 110,000 square-foot facility is tentatively slated to be located behind the Boston Pizza in the Flamborough Power Centre, subject to planning. Jill Knowlton, Primacare’s managing director of long-term care operations, said the company looks forward to bringing a planned seniors village to Waterdown. Knowlton noted the planned facility is known as a “campus of care,” which is anchored by the long-term care facility. Melchior said while the company has to work through the zoning process with the city, the company is hoping to have the facility up and running by 2021. While the investment is part of a greater $3.3-billion strategy by the province, Melchior said the long-term care component of the facility carries a $35-million price tag, split between the province and the company. McMeekin noted the Liberal government has also committed to investing more than $300 million over the next three years to hire an additional registered nurse at every long-term care home and to increase the provincial average to four hours of daily care per resident by 2022. For her part, Partridge said she is excited by the news. “One of the challenges we have in this community is affordable housing for seniors,” she said. “I’m just absolutely thrilled. McMeekin noted the investment is guaranteed — regardless of the outcome of June’s provincial election.